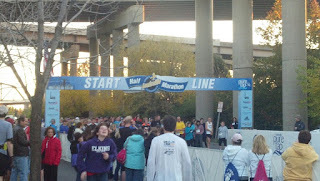 So let me tell you had the day had started...I worked Friday night from 7p-7a Saturday morning and came home to shower and change and went to line up to start the Louisville Sports Commission Half Marathon. So I had plan...since I knew I wouldn't get any sleep before the race, I adjusted to make sure I stayed hydrated. I drank a bottle of water every hour, while at work. There is a picture of me crossing the finish line for my first Half Marathon...yes, I completed my first Marathon before completing my first Half Marathon lol. 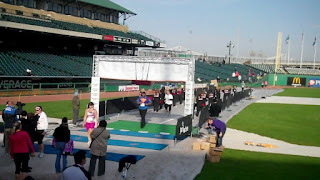 So the day before the race, Damary and I realized it would be way too cold for her and the girls to just be waiting outside for me, so for the first time, in my racing career, I would go by myself, and meet up with my family at the finish line....which the finish line is Home Plate at Louisville Slugger Field...how frakkin cool is THAT?!?! ?